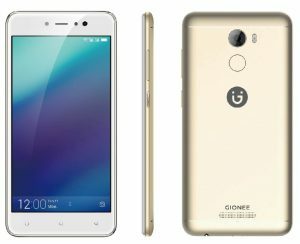 The Gionee A1 Lite wants to be that affordable bridge between a smartphone which has a good selfie camera and another which is a battery monster. In fact, darn it. With a 20-megapixel front facing shooter and a 4000 mAh battery, the A1 Lite is definitely the bridge. Retailing at a price much more reachable than its big brother (the A1), here are the details of the new device. The A1 Lite, like its senior brother, is a dual SIM smartphone with 4G LTE support and like you would expect, the device runs on the Android operating system. Android version 7 (Nougat) to be exact. On top of Nougat is Gionee’s own custom User Interface; Amigo UI, which is said to bring a few more handy features to the table. For software updates over the air, you would most likely be getting some. In building the A1 Lite, Gionee went with a premium-looking metal chassis which is chamfered at the edges and features curved corners. For color selection, you would be able to choose between black, gold and red when the device debuts in Nigeria. The device’s display is a handy 5.3 inches with a 720 by 1280 pixel resolution which brings the display’s pixel density to around 277. The IPS display on the device does not ship with any built-in protective glass, so be sure to get one on your own. On performance, the Gionee A1 Lite ships with an Octa-core MediaTek CPU (this one to be specific) which is clocked at 1.3GHz. Paired alongside is 3GB of RAM for effortless multitasking and a total on board storage of 32GB. No worries. The A1 Lite has a dedicated slot for microSD cards with capacities up to 64GB. Let’s start with the rear camera. The rear facing shooter is a 13 MP lens which has an aperture opening of f/2.0. To the right of the camera is a dual-LED flash light which provides lighting in not-so-bright environments. This camera features Phase detection Auto focus and is capable of shooting 1080p videos at 30 frames per second. The front facing camera (or what folks call ‘selfie cam’ these days) is a 20 MP shooter. Yep, you read that right. The front camera has about 7 million more pixels than the primary camera. Featuring the same f-stop as the rear cam, this camera also has its dedicated flash-light to the right. The device features a Li-Ion battery with a humongous 4000 mAh capacity. Based on the fact that the device’s features are not so ‘power-hungry’, you can count on the 4000 mAh battery to be more than sufficient enough to get you through a full day of mixed usage without having to worry about plugging in. No, the battery is NOT removable and from the reports coming in so far, the device does not have a “fast charge” feature. A fingerprint sensor is provided at the back of the device for … you know, security. Asides that, the fingerprint scanner can also be used to do other things like; taking photos and answering phone calls. Buy if you’re looking for a capable smartphone with a very good selfie camera and an excellent battery life. Bye if you do not care whether or not your device even has a camera, just so long as it’s a performance beast.